The ocean has been Phil Bresnahan’s playground and laboratory for most of his life. He grew up painting seashells and boogie boarding in the Atlantic Ocean and he now surfs, paddleboards, and invents oceanographic sensors on the Pacific Coast. 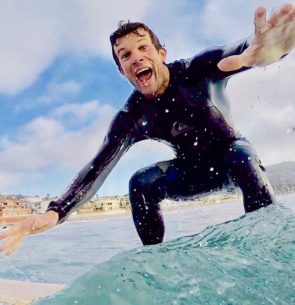 Bresnahan is a research & development engineer at Scripps Institution of Oceanography, UC San Diego, and the technology lead for the Smartfin Project: a community science initiative intended to inspire surfers to serve as better coastal stewards, introduce more people to environmental research, and collect high resolution coastal data using the sensor-equipped, IoT-enabled Smartfins. During his Ph.D. studies at Scripps, he attached a clunky, 35-pound pH and dissolved oxygen sensor to his stand-up paddleboard to teach kids of all ages that there’s more to being a scientist/engineer than sitting behind a computer screen or staring at beakers in the lab. Bresnahan has worked to get communities stoked on science throughout his career, from outreach with local schools and community groups to working with surfers-turned-citizen scientists.